Well, that 6 months went quickly. One minute we are lightly discussing the possibility of accepting a posting to Darwin – the next minute, there’s 4 weeks left til we head off. Where did the time go? We’ve done a lot of ‘down sizing’ of ‘things’ that we’ve somehow accumulated over the past 6 years – where does all that stuff come from? There were certainly a few ‘what was I thinking’ moments when looking at things to get rid of. A lot went to the local Animal Welfare League for them to sell through their 2nd hand shop to enable them to make some money for their ongoing works. Some stuff just needed to be sent to the dump, other things were given away to friends who we know will treasure what was once loved by us. Our beloved horse had to be re-homed – and if you know me at at all, you will know how that goes against every fibre of my being. However, we were a little concerned as to his ability to cope with the high humidity in the Northern Territory as well as coping with cyclonic storms. Given that he’s lived all his life in Brisbane or here in Canungra, both those concerns are very valid. Luckily for us, a lovely friend who lives nearby offered to take him for us. We know her very well and know how much she loves horses – also that she has been involved with horses all her life so we know we made the right decision in leaving Ledge with her. He will be living in the next valley over right near the Army Barracks so he isn’t going too far. I’ve sadly parted with my beautiful much loved Mini Cooper. Amid tears, I sent her to another family who already have 2 Mini Coopers in their life and I know they will look after her as well as I did. Our house has been rented out to people who love the life that can be had here in Canungra. Now, how do we get our 4 dogs, 1 cat and 1 bird up to Darwin? Well, the two big dogs (Jamaica and Poppy) and the cat will be flown up and they leave here at the end of December. I’m a bit concerned for Poppy (the Border Collie) as she is a highly stressed dog when it comes to storms so am fearful of her reaction to the plane. However, this can’t be helped and with the assistance of our amazing vet, who provide me with a relaxant for her, she will be fine. The other 2 dogs and the bird will be travelling up with us on our driving trip to Darwin – should make for an interesting trip with the bird in the back seat. The removalists arrive the week after Christmas and we head off on 1 January. Seems fitting that we start the next phase of our lives on the day the new year begins. 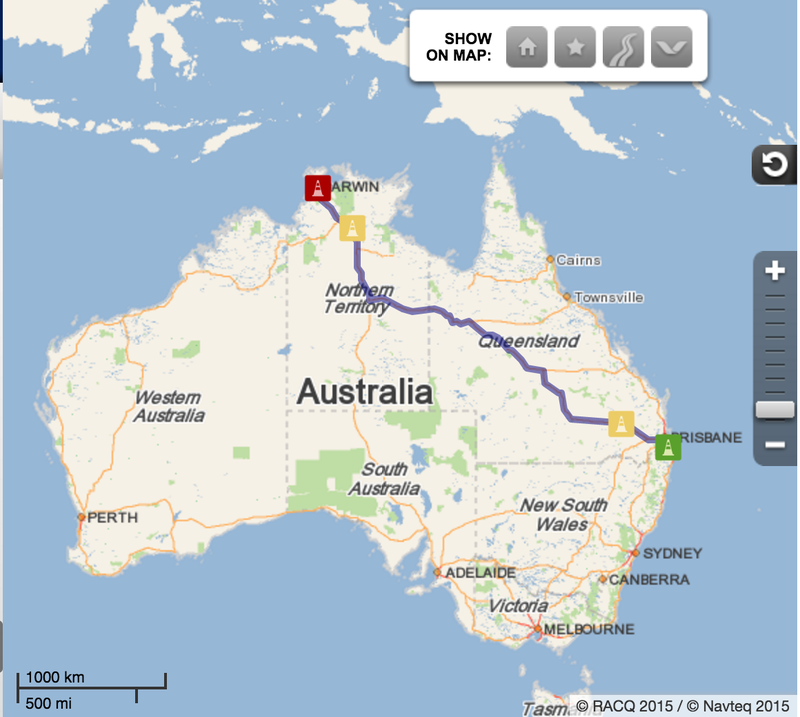 This is the route we intend to take which we intend on doing in approximately 12 days. Whilst we are on the journey, I will of course be documenting our trip and when the internet allows, will be posting photos and stories from along the way. (I am still posting stories about the trip to Birdsville but you know, time gets away). Anyway, stay safe and I look forward to showing you some amazing photographs from our big trip. What a big move. As a fellow aussie who loves to travel I take my hat off to you. Would’ve been hard parting with your horse (we have one as well) but no doubt you will have great adventures. Good luck and I look forward to following your journey. Yes it is a big move but both of us are really looking forward to it. Damian is looking forward to the role he will be playing up there and I am looking forward to the spectacular scenery and the opportunities it will provide for some, I hope, fantastic photography. Sounds wonderful. I have two girlfriends who moved there years ago with their families and they both love it. Now I just have to get up there and visit!